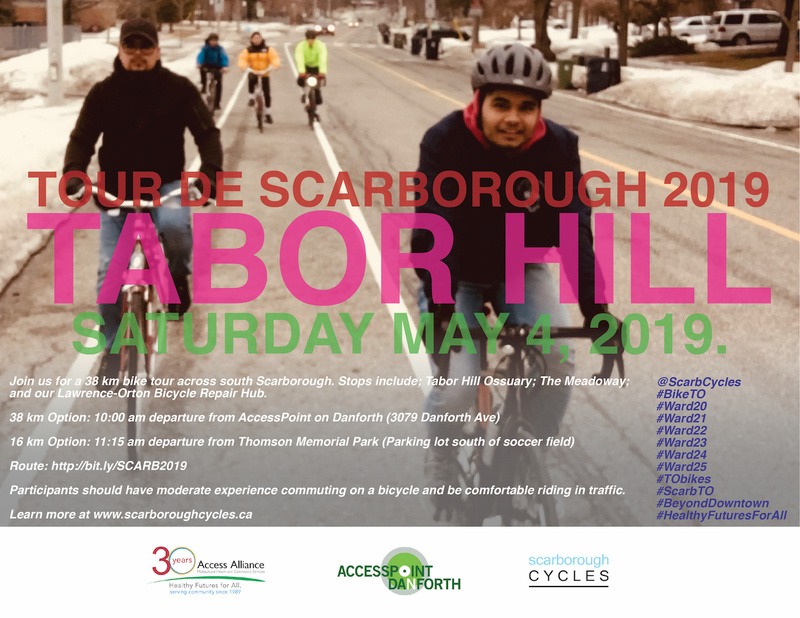 Join us for a 38 km bike tour across south Scarborough. Stops include; Tabor Hill, a ceremonial burial ground of approximately 500 ancestral Huron-Wendat members; The Meadoway; and our Lawrence-Orton Bicycle Repair Hub. 11:00 am: Arrive at Thomson Memorial Park. Gather in parking lot south of soccer field. The 38 km option from AccessPoint on Danforth to Thomson Memorial Park is suitable for participants who have moderate experience commuting on a bicycle and are comfortable riding in traffic. The 16 km option from Thomson Memorial Park to Tabor Hill, and then to our Lawrence-Orton Bicycle Repair Hub is mostly on multi-use paths and residential streets, and we ride at a comfortable pace of about 10-15 km/h.